Anita Higman and Janice Thompson. I'd read previous works by Janice but nothing by Anita before I was priviledged to read OZARK WEDDINGS by both Anita and Janice. I can't honestly tell you who my favorite main character is, but in the first of the three stories, 'Larkspur Dreams', Larkspur is quite a gal a strong-minded one at that. Then there's Clair in 'The Love Song' and she strikes a chord in me with her shyness. There's Nori in 'Castles In The Air' who's loneliness made me want to sneak a peek at the end to make sure she had a happy-ever-after ending I love in a good romance, but I restrained myself and you'll really need to read it to find out for yourself. Anita and Janice have produced a work that includes different personalities in their main characters coupled with page turning plots and great writing. Another winner goes on my shelf. 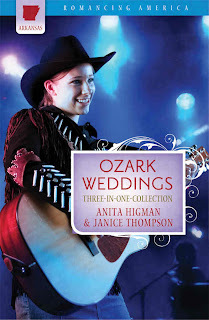 Now, I want to introduce Anita Higman and Janice Thompson - authors of - OZARK WEDDINGS - released June 2010. Anita:Ever since I was a little girl, I had this need to express myself in some sort of artistic medium. I’ve tried a number of things: piano, painting, decorating, and acting. But I’ve never been very good at any these endeavors, except writing. I guess really then—writing chose me. We’d love to have each of your readers visit our websites at www.anitahigman.com and www.janiceathompson.com. If you’re interested in our Heartsong collection, Ozark Weddings, it can be purchased in bookstores or ordered online at www.amazon.com. Joy, Thanks for inviting us to your blog! And there you have it my dear followers. Pick up a copy of OZARK WEDDINGS as soon as possible and have a wonderful read. K. Dawn, I would like, as would the readers, to know more about you, the woman, the writer, and the story you have to share. I'm married and have been for 15 years. Our first date was to church on a Wednesday night. We're best friends and have been pretty much inseparable ever since. I have a wonderful step-daughter, Brittany. She's my pride and joy and even though she's not mine biologically, she's mine in my heart. She's grown into a beautiful, strong Christian woman who I'm proud to call my own. I began writing about three years ago. I love a challenge and found learning the craft and seeking publication to be a worth while one. I still buy every book I can find on writing. If I can learn one thing to make my writing stronger, it is worth the purchase. Did you begin with Christian Fiction? I did begin with Christian Fiction. 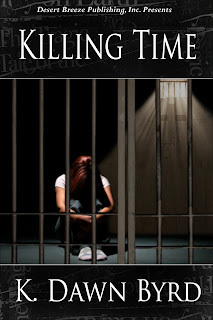 My first book, KILLING TIME, to be released August 1st through Desert Breeze Publishing. 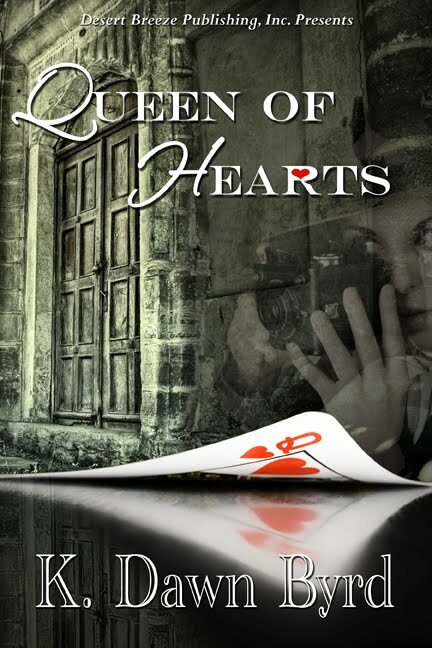 My second book, QUEEN OF HEARTS, released in April. Even though it was my second book, it came out first. What brought you to ACFW? I'd already decided that I wanted to write Christian fiction and when I found ACFW, it was a dream come true. I'm amazed at the amount of talent in that organization. The members are absolutely wonderful and so helpful. It's awesome when well-known authors take the time to answer the questions of a newbie. I've been a member for two years. When can we expect your novel, KILLING TIME, in the bookstores, K. Dawn? KILLING TIME is my August 1st release. of an inmate who allegedly died of an overdose. and emotional abuse from the other inmates. charges before she loses him forever? In which genre your newest novel? KILLING TIME is a contemporary romantic suspense. What is it about that particular genre that interests you the most? I write what I love to read. Suspense is my favorite. Throw in a little romance and we have a deal! I especially love unpredictible books. Throw me a zinger! Because I love those books, that's what I write. Readers should expect thte unexpected when they read my work. About that sneak-peek of the content I mentioned to our readers? Mitch was waiting for her in the visitation area. Mr. Blair, his attorney, at his side. Delacy ushered her to a glass-front cubicle. Mindy longed to touch Mitch, to draw strength from someone stronger than herself, but the glass made this impossible. Mr. Blair smiled and nodded toward the phone. Mindy picked it up, anxiety making her a little light headed. She shivered as the cold hard plastic of the receiver came into contact with her ear. "Hello, Mindy," the elderly attorney said. "It's good to see you again. I wish it were under better circumstances." "Me, too." They'd come to get her. She was going home. "I can't represent you. I'm semi-retired and handle mostly real estate transactions. This is out of my league, so I'm going to call a good friend of mine, Bill Sands, and ask him to get in touch with you. He's a good attorney." "Thank you." Tears threatened to overflow. "I need to ask you some questions though. Okay?" "What led up to your arrest?" "A few days ago, I realized that someone had gone through my desk at work. The signature stamp I use to endorse payroll checks was missing." Mr. Blair touched his mouth with the top of his pen. "Whose name was on the stamp?" "My boss. His name is Mr. Warner. I kept a few personal items in my desk, like deposit slips for my own bank account. Someone used the stamp to endorse checks and then deposited them into my personal account." Embezzlement. What an ugly word. "Any idea who did this?" "I believe it was my boss' son, Rick. I've had a bad feeling about him from the time I met him. I don't trust him. When he moved back from out west, Mr. Warner gave him an executive position in the company and check cashing privileges." "Why would he frame you?" "He started writing big checks. Thousands of dollars. He was so afraid I'd tell on him that he threatened to have me fired." Mr. Blair scribbled furiously on a yellow legal pad. "What'd he need all that money for?" "I heard a rumor that he has a gambling problem and owes a lot of money to dangerous people." "Do you have the money yet from selling Grandpa's house and land?" Mr. Blair had represented Mindy in the closing. She'd held back selling as long as she could, but the house was too large for her to maintain. The new roof and plumbing problems had almost drained her bank account. Mr. Blair's eyes met hers. "I'll call Bill today with this information. He'll be in touch. Good-bye, Mindy. Take care." The sympathy therein spoke volumes. He handed the phone to Mitch. "Hey, Baby," he said in a voice as smooth as milk chocolate. Mindy's heart tugged when Mitch smiled. His good looks weren't lost on her. He could turn on enough charisma and charm to benefit him in any situation. "Mindy, honey. I'm sorry that you're in here, but I need your help. Do you remember the new case I told you about? The one where that young girl died of overdose." Mindy's overloaded brain scrambled to keep up. She nodded. Mitch ran his fingers through raven black hair. "Keep your eyes open, love. That client is paying me a lot of money for information about her daughter." "I'll ask around when I go back to the pod. What time am I leaving?" "Not today," Mitch said. "I need you. I need that information." "You're not getting me out of here?" Mindy's voice rose to hysteria. Mitch couldn't have slapped her in the face and hurt her more. Reality washed over her in a chilling wave. She wasn't going home. He was leaving her to work undercover. Hot tears of anger blazed a trail down Mindy's cheeks, but she didn't care. "You're not going to leave me here," she spat, as if the demand itself had the power to force him to change his mind. "Not for long, baby. You'll be okay. You're a strong woman. That's one of the things I love about you." "Please don't leave me here, Mitch." Mindy's voice trembled. "You don't know what it's like back there. Please take me home. I just found my sister." "Your sister? What are you talking about?" "Remember? I told you I have a twin? I've got to get out of here so I can help her." Mindy placed her hand on the glass, the tears on her palm smearing her reflection. "Please, Mitch." "It's not for long, baby. You'll be okay." His expression faltered for an instant and she thought he was about to change his mind. Just as quickly, his eyes hardened. "I've got to go now, baby. Take care of yourself." Before Mindy had the chance to reply, Mitch replaced the receiver. She looked at Mr. Blair. Her face must have conveyed the terror and sense of abandonment she felt. His expression was one of sorrow and helplessness. Mindy watched Mitch exit the room, his head high and step light. He never looked back. K. Dawn, would you share your professional bio-sketch with our readers so they will have your contact information? 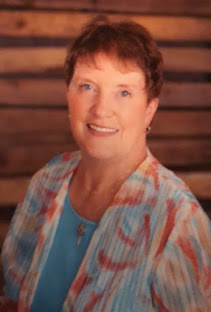 K. Dawn Byrd is an author of inspirational romance. 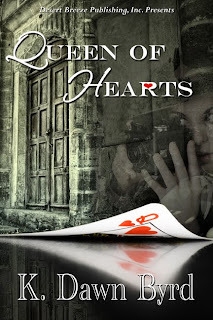 QUEEN OF HEARTS, a WWII romantic suspense released in April and was Desert Breeze Publishing's bestselling novel for the month. KILLING TIME, a contemporary romantic suspense to be released August 1, also with Desert Breeze Publishing. most of which are signed by the authors. She's also the moderator of the popular facebook group, Christian Fiction Gathering. K. Dawn, is there anything I may have neglected to ask that you'd like readers to know? I want to express my appreciation to you for joining us this week, K. Dawn. Thanks so much for hosting me on your blog, Joy! You are very welcome, K. Dawn. 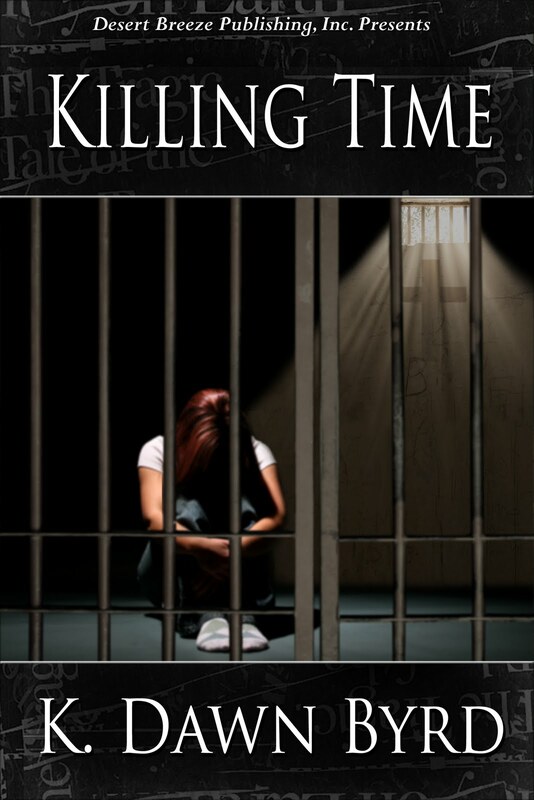 Be sure to read this e-suspense novel by writer, K. Dawn Byrd ~KILLING TIME~ to get the 'rest-of-the-story'. Until next time~ this is Joy Avery Melville, Joyfully thanking you, the reader and our guest, K. Dawn Byrd, for spending time with us today! It's that time again. We have a wonderful opportunity as AMERICANS, CHRISTIANS and most of all COMPASSIONATE HUMAN BEINGS to celebrate and remember those who have served or are serving in our Armed Forces; those men and women of Valor, Spirit and Dedication who desire to keep AMERICA FREE. AMERICA has had millions of men and women who have placed their personal safety in the hands of their brothers and sisters during war-time. They have chosen a path that gives them purpose, direction and honor. Granted, not every service person who has enlisted plans to go to war, but the other night on the news I was amazed at the number of men and women choosing to put their life on the line to keep FREEDOM possible for AMERICANS and those who believe in democracy. I want to personally thank my brothers, Vernon and James for their choice to serve. 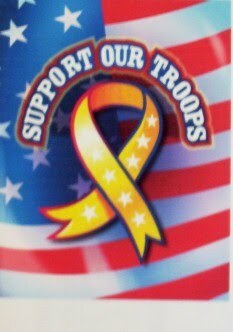 MY brother Vern went to Germany to drive transport for the Army and Jim, also in the Army, went to Viet Nam. My nephew, Jason (Vern's only son) went into the Army before Desert Storm. He was stationed in Germany like his father before him. Although he was to be discharged and was planning for his upcoming trip home a call came through for volunteers, he was one of the very first to say, "I'll go. Where do I sign?" I am so proud to know I have family members who are/were willing to die for our hard-fought-for freedoms. For those of you who have served, are serving, who have family members in those categories, or who have paid the ultimate price, it is with deep gratitude and a huge 'Thank you' from the bottom of my Joy-Filled heart! A Joy~Full, good morning to you, my dear readers. I want to express my gratitude for my Lord and Savior, Jesus Christ, for the opportunity I have to write for His glory. A fellow writer saw my need for some help in working with another site and came along side, figuratively speaking, volunteering assistance in the middle of my struggle. She didn't boast her technilogical prowess, she didn't ask for repayment. Instead she offered her time, expertise and most touching of all, a gesture of friendship. How do you value that encouragement and support? I see it as priceless. It may take mere moments, it may take hours, but the generosity and willing heart of someone who chooses to help another rather than selfishly keep her time and projects or knowledge to herself is someone to be commended and is Joy~Fully welcomed. To be that type of friend is to be prepared by being open to the needs of others; to be observant; to be willing to ignore the self-cost of effort, time and possibly money for the sake of another. Seeking to help a person who could easily be competition is a true mark of a Joy~Filled Spirit extending an open hand of kindness. I experienced just such an example of that kindness last week. I felt supported by her encouraging, selfless act of friendship in a time-consuming task. Not once did I see a hint of restraint from this busy writer and new-found friend. Joy certainly filled my heart and continues to glow from within.